Place sweet potato in pot, filled with cold water. Bring to the boil and simmer for 10 - 15 minutes until tender. Remove from the heat, drain and mash. In a bowl, add mango chutney, wholegrain mustard & natural yogurt. Mix. Pour 1 teaspoon of oil in an ovenproof dish and slide oil around dish to cover the base. Place chicken into the dish and then pour chutney marinade over the chicken. Cover the dish with aluminium foil and cook in oven for 20 minutes until cooked through. 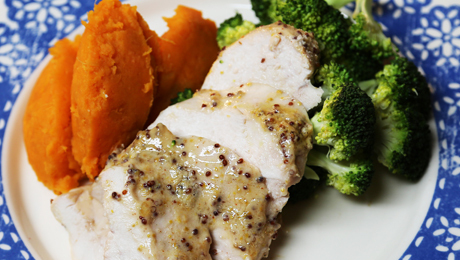 Remove the chicken from the oven, and serve with broccoli and sweet potato mash.